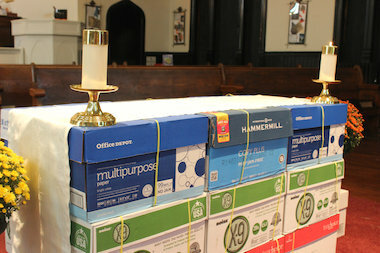 All Saints Episcopal Church built an altar out of a ton of paper, which it will donate to CPS schools. RAVENSWOOD — Church altars — the central focus of Christian services — are often elaborate affairs, crafted out of marble or intricately carved wood. All Saints Episcopal Church, 4550 N. Hermitage Ave., built its out of paper. Boxes and reams of paper. The temporary altar, on display during Sunday worship, was constructed out of a portion of the 2,500 pounds of paper the church collected over the past several weeks as part of a school supply drive. The paper drive, according to Pastor Bonnie Perry, was sparked by parishioner Jennifer Boyle-Tucker, who asked where education fit in the church's mission. "We've been doing backpack blessings for six or seven years and we've done school supplies before," said Perry. "This year we got really focused." As part of the church's outreach, All Saints, through Ravenswood Community Services, serves tons of food to neighbors every month. "Why not a ton of paper?" Perry said. Parishioners responded to the call, either ordering paper online and having it shipped to the church or delivering reams to All Saints in person. Turning the paper into an altar — not all 2,500 pounds were used, Perry noted, because the church, already under renovation, didn't want the floor to cave in — served a dual purpose. "Making it the central thing shows how much we care about education," said the pastor. "But also, there are gross inequities in the city. Some schools have enough and some schools don't." The paper will be distributed among neighborhood schools, including Ravenswood and McPherson elementary schools and Amundsen and Lake View high schools. "It's one step in the beginning of what we as a community decide to do," said Perry.